Erica Perna has been a professional writer and educator since 1999. She specializes in health and fitness, travel and the history of the English language. Perna holds a Master of Arts in English language and literature from the University of Toledo, and is a certified fitness instructor and personal trainer. You already know that water is essential to your health, and you probably already get an adequate amount of fluids to meet your basic needs. If you are exercising, however, you need to increase your water intake to make up for the fluid you lose when you sweat. It is important to drink water in regular intervals before, during and after your exercise session. More than half of your body weight is comprised of water, and you need water to maintain proper functioning of every organ and cell in your body. Water is necessary for bodily functions such as waste removal and joint lubrication. When you are exercising, water also helps to regulate your body temperature. If you do not drink enough water during your exercise session, you are putting yourself at greater risk for dehydration and further complications. If you become dehydrated during exercise, your muscles will begin to fatigue. You may experience cramps, weakness and loss of coordination. In a state of dehydration, your body is unable to cool itself, which can lead to serious consequences such as heat exhaustion or heat stroke. 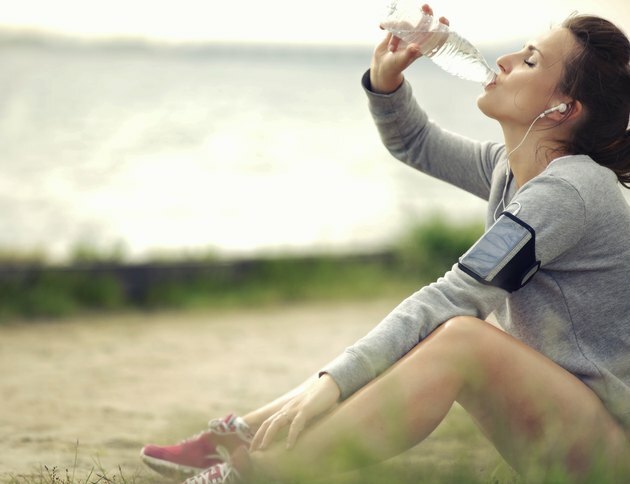 To avoid dehydration, you need to be aware of the amount of water you drink not only while you are exercising but also before and after your workout. The American Council on Exercise recommends drinking 17 to 20 ounces of water two to three hours before beginning your workout. About 20 to 30 minutes before your workout, drink another 8 ounces. While you are exercising, drink 7 to 10 ounces every 10 to 20 minutes. Within 30 minutes of completing your workout, drink an additional 8 ounces. Weigh yourself before and after your workout, and drink an additional 16 to 24 ounces. for each pound you lost during your workout. For convenience, carry a water bottle with you throughout the day. Refillable bottles with ounce markings make it easy to keep track of your water intake. For a splash of flavor, try squeezing some lemon or lime juice into your water bottle. To check if you are adequately hydrated, take a look at your urine. If it's dark yellow, increase your fluid intake. The Dr. Oz Show: How Much Water Do You Really Need? How Many Bottles of Water Should You Drink in a Day? How Much Water Should You Drink When Nursing? What Does Gatorade Do for Athletes? How Much Water Do You Need to Drink in Early Pregnancy?